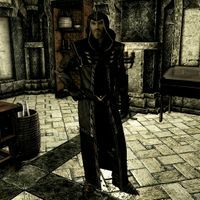 Rulindil is an Altmer interrogator, and the Third Emissary of the Thalmor, located in the Thalmor Embassy. He reports to Elenwen, the First Emissary. You can overhear an argument with Gissur about payment for his information. Afterwards, Rulindil heads down to the dungeon to interrogate Etienne Rarnis. He wears hooded Thalmor robes, Thalmor boots, and Thalmor gloves. He also carries the Interrogation Chamber Key and an elven dagger. This page was last modified on 2 September 2013, at 21:41.